Can not start Cognos Planning client programs on new computer where the new Client software is installed for Cognos Planning. 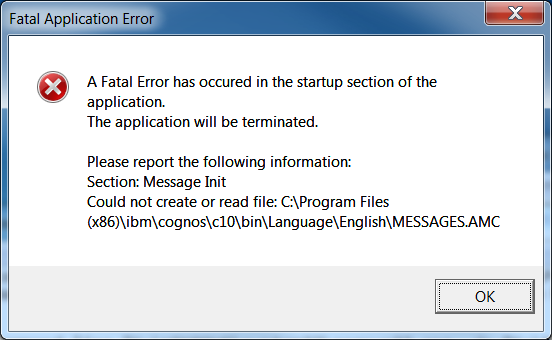 A fatal error has occured in the startup section of the application. The user that start the planning programs first time, they need to have write access to the folder where the program is installed. Because the program will create a file called MESSAGES.AMC. On the client computer go to the folder c:\program files (x86)\ibm\cognos\c10 and right click. Select Users in list and click Edit. Select Users and click in Modify at the Allow column. This should give all users on that computer write access to the folder C10, try to start your Cognos Configuration or Cognos 10 Planning Analyst program again.